We appreciate the help and support from our past fundraising partners! On February 12, 2016, the Mercyhurst Prep School Girls Basketball Team and Lady Lakers Cheerleaders raised funds for StringsforaCURE and the Erie Chapter of Making strides American Cancer Society during their 7th Annual “Shooting for a Cure” campaign. Elisa Guida, Founder and Executive Director of StringsforaCURE attended and spoke at the Mercyhurst Prep banquet where they presented StringsforaCURE with a check for $1,500. Donations and fundraisers, such as these, make it possible for StringsforaCURE to further its mission to provide education, comfort, support and financial assistance directly to the cancer patients, primarily those with breast cancer. On February 21, 2016, the La Nuova Aurora Society presented a total of $60,000 to 40 different charities in the Erie County area. StringsforaCURE received a $1,000 donation. Their generous donations are made possible by the monies raised through the games of chance played by members of the La Nuova Aurora Society throughout the year. Pictured are Tony Dedad, President of La Nuova Aurora Society, Patti Larson, Development Director/Treasurer of StringsforaCURE and Elisa Guida, Founder and Executive Director of StringsforaCURE along with two representatives from other charitable organizations It is through the support of the community with donations such as these that make it possible for StringsforaCURE to further its mission to provide education, comfort, support and financial assistance directly to the cancer patients, primarily those with breast cancer. In 2015 led by a team of more than 200 associates, 14 community partners, Lilly Broadcasting and one worthy charity, Saint Vincent shot its “Altogether Pink” dance video in support of the fight against breast cancer for the national Medline Pink Glove Competition last summer. The video earned a fifth place ranking nationally. Associates, along with the Regional Cancer Center, Oncology Nursing Society and Erie Fire Department, raised $3,059 for StringsforaCURE during the fall season. Pictured presenting the check to the project’s chosen charity — StringsforaCURE — are, left to right, are Scott Whalen, President and CEO of Saint Vincent; Darren Hart of the Erie Fire Department; Elisa Guida of StringsforaCURE; Saint Vincent Chief Nursing Officer, Maureen Chadwick; Susan Roche, President, NW PA Oncology Nursing Society (ONS) Chapter; and Chelle Wescott, President Elect, NW PA ONS Chapter. The funds raised continue to support the StringsforaCURE programs which provide, education, support and financial assistance directly to breast cancer patients. The Bill n Bob Folk Festival was started three years ago by Bill Kern and Bob Dartnell, both of whom love music and also wanted to make a difference by trying to raise a little money for StringsforaCURE. This has since turned into a miraculous story of what can happen when a community joins forces. 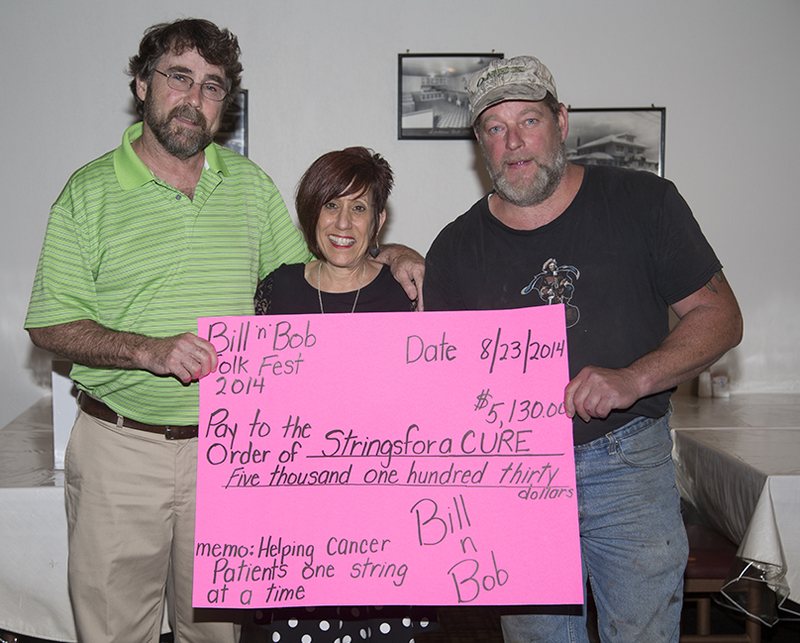 The 2015 Bill n Bob Folk Festival, held on August, 2015 at the Fairview Legion Park, raised $16,200 for the StringsforaCURE Foundation. Pictured above are Bob Dartnell, Elisa Guida, SFAC Founder and Executive Director, and Bill Kern. Continued support from the community enables StringsforaCURE to provide financial assistance directly to breast cancer patients in the form of $100 gift cards, medical grants, comfort baskets and educational materials, as well as a new grant program to provide financial assistance for living expenses. Zone Dance Club Supports StringsforCURE with Fundraiser! The Zone Dance Club hosted its Annual Breast Cancer Awareness Weekend, on October 2, 3 and 4, 2015 and raised $2,608 for StringsforaCURE. In this photo, Grace Watson, a breast cancer survivor, and her son, Michael Watson present a check to StringsforaCURE for their donation. StringsforaCURE provides education, comfort, support and financial assistance to cancer patients, primarily those with breast cancer by offering $100 Gift cards, Medical Grants, Living Expense Grants, books and comfort baskets to those with breast cancer. The StringsforaCURE Pickin’ On Cancer Planning Committee members celebrate the success of their 4th Annual Fundraiser, which was held at Bel-Aire Clarion Hotel on Friday, October 2, 2015. The fundraiser included music by Silverlight and Friends, a gift basket auction, 50/50 and a silent SFAC Jewelry auction. The event this year raised $31,305 for the StringsforaCURE Foundation. Pictured above (L-R) are Nicole Brugger (POC Committee Chair and SFAC Board Chair, Jan Minzenberger, SFAC Board Secretary, Carol Hirsch, Beth Dubik, Donna Rose Sherrange, Elisa Guida, SFAC Founder and Executive Director, and Patti Larson, Development Director/Treasurer. The generous support from the community has enabled StringsforaCURE to continue to provide financial assistance directly to breast cancer patients including two new programs, one to provide financial assistance for living expenses as well as a scholarship. The Ambridge Rose Spa & Salon continued their support for The StringsforaCURE® Foundation by donating $425 from the sale of Pink Hair Extensions through their salon during Breast Cancer Awareness month, October 2015. Left to right: Jenn Powierza, Rose Cortes, Allie Pepicello, Michelle Gerhard & Char Szymanowski. Continued support from the community has enabled StringsforaCURE to provide financial assistance directly to breast cancer patients including a new grant program to provide financial assistance for living expenses. Mixing the theme of a “Bra Crawl” with visits to five local bars and an award for the “Best Blinged Bra” as well as a Grand Prize on Saturday, October 17, 2015 resulted in fun for all who attended and $1,370 in donations raised for StringsforaCURE. The event, hosted by Rocket 101 and emceed by DJs, Mojo and AC, included music, dancing, T-Shirts and awards. Pictured above for the check presentation at Rocket 101 Studios are (L-R) Elisa Guida, Founder and Executive Director of StringsforaCURE, morning DJ, Allen Carpenter (A.C.), Patti Larson, Development Director/Treasurer of StringsforaCURE and DJ, MoJo McKay (MoJo). The money raised will enable StringsforaCURE to purchase 13 $100 gas grocery and pharmacy Gift Cards from local vendors in Erie to send directly to cancer patients undergoing treatment for breast cancer. Pictured to the left are Lisa Louis, Director, Regional Cancer Center, Selleena Ellsworth from the Divas, Patti Larson, SFAC Development Director/Treasurer and Elisa Guida, SFAC Founder and Executive Director. The sale of the 2016 Divas calendar generated a total of $1,571, which was split between the Regional Cancer Center and the StringsforaCURE Foundation. Continued support from the community enables StringsforaCURE to provide financial assistance directly to breast cancer patients in the form of $100 gift cards, medical grants, comfort baskets and educational books on health, wellness and cancer prevention. The Siebenbuerger Club organized a golf outing at the Erie Golf Course to benefit the StringsforaCURE Foundation on June 27, 2015. In addition to the rounds of golf played at the golf course, an Ames driver and other golf accessories were also raffled off. The event was followed by a hearty buffet lunch at the Siebenbuerger Club. Despite the very rainy weather that day, spirits and enthusiasm were high as were the donations for the raffle items. In addition to the $1500 donation directly from the Siebenbuerger Club, an additional $551 was raised from the sale of the raffle tickets. Pictured above Siebenbuerger Club President, Chris Rendulic, presents a check to the StringsforaCURE (SFAC) Board of directors. The SFAC board members included in this picture are: (L-R) Patti Larson, Development Director and Treasurer, Carol Hirsch, Chairperson, Jan Minzenberger and Elisa Guida, Founder and Executive Director. Also pictured, Chris Rendulic and Paul Causgrove, Recording Secretary and Golf Outing organizer. Continued support from the community enables StringsforaCURE to provide financial assistance directly to breast cancer patients in the form of $100 gift cards, medical grants, comfort baskets and educational books on health, wellness and cancer prevention. 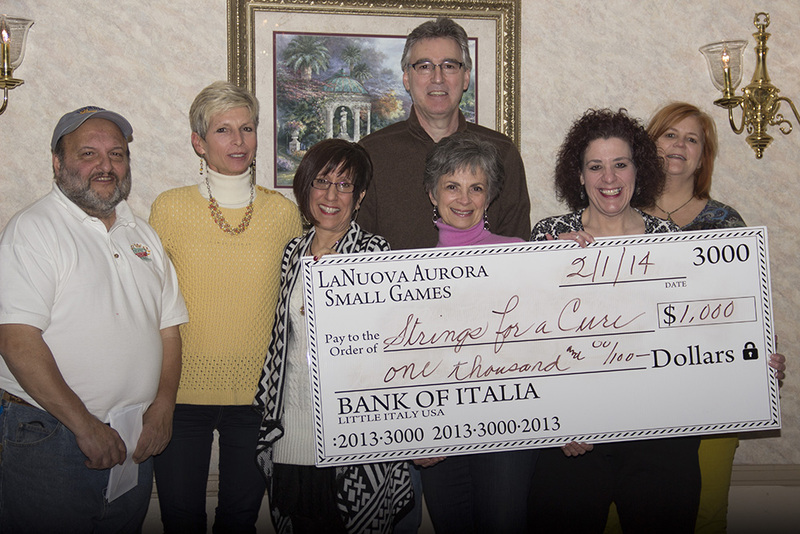 StringsforaCURE® (SFAC) Board Members, Patti Larson, Carol Hirsch and Elisa Guida, SFAC Founder and Executive Director, were among the representatives from numerous local charities on hand at the La Nuova Aurora Club on Sunday, February 15, 2015 to receive checks from the La Nuova Aurora Society. StringsforaCURE received $1,000 out of a total of $43,250 that were donated to selected local charities. Donations such as these make it possible for StringsforaCURE to further their mission to provide education, comfort, support and financial assistance directly to the cancer patients, primarily those with breast cancer. The Zone Dance Club raised $2,027 for StringsforaCURE during their Breast Cancer Awareness fundraising event on October 12, 2014. Several SFAC Board members attended the event. Support from the community enables StringsforaCURE to continue to provide comfort, support and financial assistance directly to breast cancer patients. Connecting Hands of Erie, PA, a local non-profit that raises funds for local charities through “Garage Sales, ” raised $5,000 for the StringsforaCURE Foundation at their garage sale on March 6 and 7. This charming group of volunteers worked tirelessly to organize the donations of furniture, household items, books and many other items into a pleasant place to shop for bargains. The volunteers included in this picture are: (1st row L-R) Carol Kuna, Mary Anne Geary, Edith Coccarelli, Lil Laskowski (Vice President), Diane Canfield, Sherry Brine, Elisa Guida (Founder and Executive Director of SFAC), Sue Haener, Linda Maroney, (2nd row L-R) Norma Adams, Pam Will (President), Sandy Pierson, Sue Hagle, Diane Baumgardner and Kitty Beaver. Support from the community enables StringsforaCURE to continue to provide financial assistance directly to breast cancer patients. Buffalo Wild Wings in Erie held a fundraiser on February 16, 2015. Despite the sub-zero temperatures, ice and snow, the “Eat Wings and Raise Funds” fundraiser was well attended and very successful in raising over $339 for the StringsforaCURE Foundation. Tony Barilla, Manager of Buffalo Wild Wings, on the left in the picture to the left, hands the check to Elisa Guida, Founder and Executive Director of StringsforaCURE. Tony and his staff provided great service to the SFAC supporters who braved the cold to show their support. This money enables StringsforaCURE to purchase $100 gift cards for gas, grocery and pharmacy which are provided directly to breast cancer patients. Heather Eaglen drops off the Christmas cookies that were made and donated by the Women of Sterling Ridge. Several of the StringsforaCURE Board members then delivered the Christmas cookies to five local breast cancer patients in time for the Christmas holidays! We would like to thank Rosy Cortes and Char Szymanowski of Ambridge Rose Spa and Salon for donating over $200 to StringsforaCURE® during the Breast Cancer Awareness month selling pink hair extensions. Elisa Guida (left), Founder and Executive Director of SFAC, accepts check from Rosy Cortes (right), Ambridge Rose Spa and Salon. The monies will enable StringsforaCURE to purchase two more $100 gas, grocery and pharmacy gift cards to give directly to breast cancer patients undergoing treatment. All gift cards are purchased locally! The students at Our Lady’s Christian School for raised $234.95 for the StringsforaCURE® Foundation during their October 22nd dress down day. The fundraiser was coordinated by Jennie Hagerty, Director of Parish and School Advancement at Saint Jude the Apostle Church, and Nicole Brugger, StringsforaCURE volunteer and SFAC Board Secretary. Pictured left to right: Ella Springer, Kelly Fessler, Elisa Guida, StringsforaCURE Founder and Executive Director, Mr. Stephen Nemenz, OLC Principal, Elizabeth Swanson, and Jenna Brugger. Elisa Guida was invited to talk to the students and teach them about the foundation’s work to educate comfort, support and provide financial assistance to cancer patients, primarily those with breast cancer. Elisa was delighted to see such enthusiasm with the younger generation as they give back to women who are diagnosed this disease. The members of the North Coast Sewing Guild donated their time, talent and materials to create 77 unique, one-of-a-kind purses. The charitable sewing event was coordinated by Sewing Guild member, Char Popson. During the Sewing Guild’s Annual Event and Luncheon on September 14, the purses were officially presented to representatives of StringsforaCURE. Pictured left to right are Carol Hirsch, SFAC Board Chairperson, Linda Wilkinson, former SFAC Board Member, Kimberly Jones, President of the North Coast Sewing Guild, and Char Popson. The purses, which will contain a number of specially selected items, will be part of a new offering as the StringsforaCURE Foundation continues to provide education, comfort, support and financial assistance to those diagnosed with breast cancer. Bob Dartnell and Bill Kern, who organized the Bill ‘n Bob Folk Festival, donated the proceeds from the event to Elisa Guida, Founder and Executive Director of the StringsforaCURE Foundation. The festival included the music of several different local bands, as well as food and beverages, 50/50’s and auction items. This check presented to Elisa Guida, in addition to a private donation made prior to the event, brought the total amount raised for the event to $5,370. The monies will enable StringsforaCURE to purchase 53 $100 gas, grocery and pharmacy gift cards to give directly to breast cancer patients undergoing treatment. All gift cards are purchased locally! SFAC Receives $8,464 from Erie Gives! This was the most successful Erie Gives Day so far! In just 12 hours, $2,255,550 was raised for nonprofit organizations in the Erie Community! This far surpassed the donations from the last three years of Erie Gives! In addition, every participating nonprofit that received a donation also received a percentage of the $200,000 prorated match pool from GE Transportation, Erie Insurance, Presque Isle Downs & Casino and The Erie Community Foundation! StringsforaCURE received $8,464.60 in donations, which includes the prorated matching funds so generously donated by the organizations above. This will help us to purchase 84 more $100 gift cards for gas, grocery and pharmacy for those patients going through treatment for their cancer. StringsforaCURE Founder and Executive Director, Elisa Guida, and Development Director, Patti Larson, accept a $1,250 check from Erie Explosion star football player, Shon Rowser. The money was raised as part of the Breast Cancer Awareness Fundraiser during their April 27th game. An additional donation of $500 from Rebich Investments was also received. The monies will be used to purchase 17 $100 gas, grocery and pharmacy gift cards to give directly to breast cancer patients undergoing treatment. Donations such as these make it possible for StringsforaCURE to further their mission to provide education, comfort, support and financial assistance directly to the cancer patients, primarily those with breast cancer. StringsforaCURE Board Members, StringsforaCURE® (SFAC) Board Members, Patti Larson, Elisa Guida, Chuck Leone, Linda Wilkinson, Maria Gaeckle, and Carol Hirsch were on hand at the La Nuova Aurora Club on Saturday, February 1, 2014 to accept a check for $1,000 from club president, Tony Dedad. StringsforaCURE was one of 23 nonprofit organizations in the Erie area to receive a donation from La Nuova Aurora Society as part of their small games revenue. Donations such as these make it possible for to further their mission to provide education, comfort, support and financial assistance directly to the cancer patients, primarily those with breast cancer. 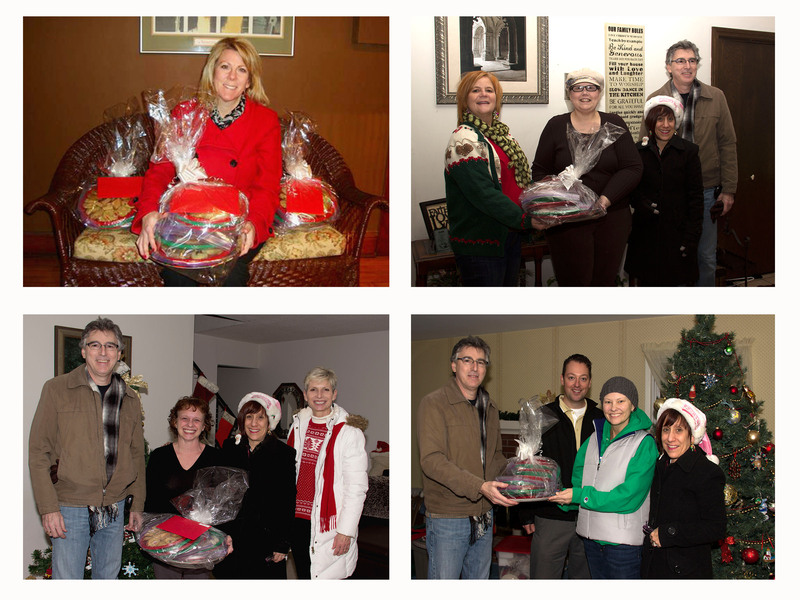 StringsforaCURE Board Members, Elisa Guida, Carol Hirsch, Chuck Leone and Patti Larson, delivered Christmas cookies to three breast cancer survivors, Lisa Decarolis, Rachel McCart Pfeifle and Nikki Pachell on December 10, 2013. Heather Eaglen donated the cookies which were made by the Women of the Sterling Ridge Cookie Exchange. Through the support of the community, StringsforaCURE is able to provide education, comfort, support and financial assistance directly to the cancer patients, primarily those with breast cancer. Elisa Guida, founder and executive director of StringsforaCURE (SFAC), and her husband, Ed Saloum, were VIP guests of Mayor Joseph Sinnott during Celebrate Erie. 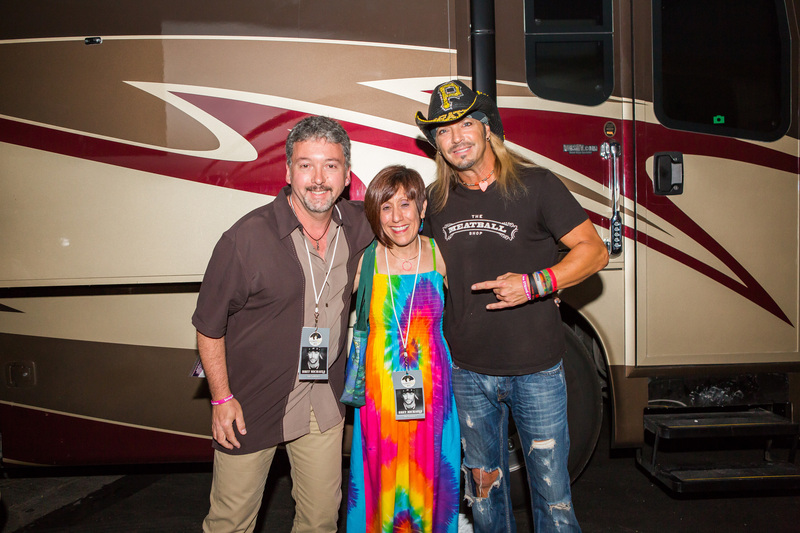 Bret Michaels donated a set of his used guitar strings before his performance on August 17, 2013. Elisa then presented Bret with a SFAC wristband, which he immediately put on and wore during the show. Elisa, a two-time breast cancer survivor, transforms the guitar strings into one-of-a-kind bracelets, earrings, pendants and rings. Proceeds are used to further the mission of StringsforaCURE to educate, comfort, support and provide financial assistance to so many cancer patients, primarily those with breast cancer. The Zone Dance Club raises $2,018 for StringsforaCURE! The Erie community continues to show its support of a local charity, StringsforaCURE, through their own fundraising events. The Zone Dance Club hosted their 8th Annual Breast Cancer Awareness Weekend, on October 4th, 5th, & 6th, organized by Michelle Michaels. The event raised $2,018 and StringsforaCURE was named the beneficiary of the fundraiser. In this photo, Grace Watson presents a check for that donation to Elisa Guida, SFAC Executive Director and founder of the charity which provides education, comfort, support and financial assistance to cancer patients, primarily those with breast cancer. Elisa Guida, Executive Director and Founder of StringsforaCURE, a charitable organization that helps to educate, comfort and support and provides financial assistance directly to cancer patients, primarily those with breast cancer receives a check in the amount of $750 from Gail Kraus, Mike Martin, Owner of Printing Concepts, and Peg Williams on November 14, 2013. Martin, Kraus and Williams organized last year’s seminar, “Breast Cancer… A Journey …It’s Personal”, in honor and in memory of Martin’s wife, in the hopes of educating the community about breast cancer. StringsforaCURE “Pickin’ On Cancer” Event Raises Over $24,000! Left to right: Maureen Kurtic, Patti Larson, Nicole Brugger, Carol Hirsch (committee chair), Lisa Jenkins, Linda Wilkinson, and Maria Gaeckle. Missing from the picture are: Roxanne Saloum, Beth Dubik, Bryana Hayes and Elisa Guida. The Pickin’ On Cancer Planning Committee celebrates the success of their Fundraising event held on Saturday, October 5, 2103 at the Brewerie at Union Station where they raised a record $24,000. The event included live music by the Heliotropes, Silverlight and Eric Brewer and Friends. Other activities included a Gift Basket Raffle, Silent Art Auction, 50/50’s, Card Game Prize Board, and Prize Wheel as well as a door prize, the HOPE pendant, created from the guitar strings donated by musician, Chris Daughtry. StringsforaCURE provides education, comfort, support and financial assistance directly to cancer patients, primarily those with breast cancer. StringsforaCURE Receives $2,792.27 Through Erie Gives! 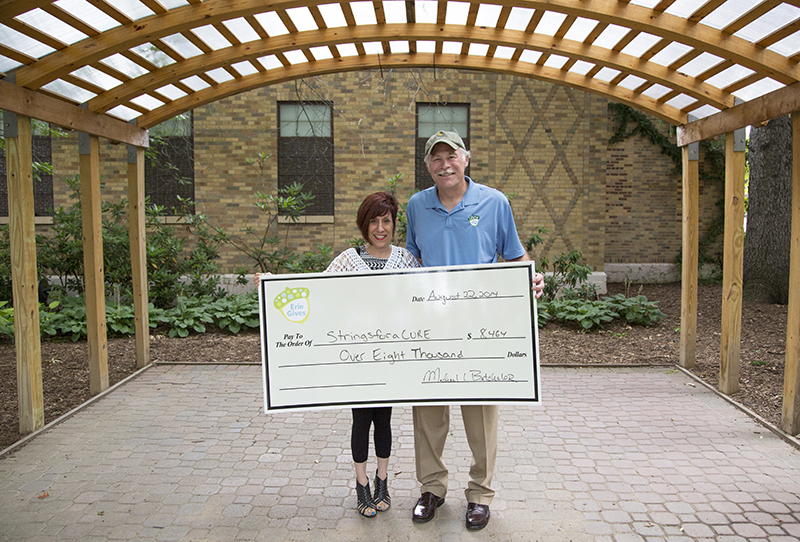 Mike Batchelor, President Erie Community Foundation presents a check to Elisa Guida, Founder and Executive Director of StringsforaCURE, in the amount of $2,782.27 during the press event at the Erie Zoo on August 23, 2013 for Erie Gives. During the 12 hour on-line giving campaign more than 4,000 donors gave over $1.7 Million to support the work of 301 different nonprofit organizations. StringsforaCURE provides education, comfort, support and financial assistance directly to cancer patients, primarily those with breast cancer. McDowell Soccer Boosters Raise $500 for StringsforaCURE! Steve Mraz, President of the McDowell Soccer Boosters, presented Elisa Guida, Founder and Executive Director of StringsforaCURE with the money that was raised last season during their “Give Cancer the Boot” game between McDowell High School and Cathedral Preparatory high School. StringsforaCURE provides education, comfort, support and financial assistance directly to cancer patients, primarily those with breast cancer. Bob “Dart” Dartnell and Bill Kern organized the Bill and Bob Festival, which took place on Saturday, August 3, 2013. The musical festival, which included live music by local musicians, raised money through sponsorships from PSB Industries and the Sportsmen’s Athletic Club as well as private donations during the event. A check was presented to Elisa Guida, Founder and Executive Director of StringsforaCURE, at the Sportsmen’s Athletic Club on August 6, 2013. StringsforaCURE provides education, comfort, support and financial assistance directly to cancer patients, primarily those with breast cancer. Elisa Guida, Executive Director and Founder of StringsforaCURE, a charitable organization that provides education, comfort, support and financial assistance directly to cancer patients, primarily those with breast cancer, received $3,000 from the Nuova Aurora Society on Saturday, January 26, 2013. These McDowell students, Julian (L) and Landon (R) raised $500 for StringsforaCURE by spearheading their own Pennies2Patients campaign at five Tim Hortons around Christmas time (2012). SFAC thanks both of them for their community service work! Great job!